[ARCHIVED THREAD] - Anyone have JP new generation tubes? I'm thinking of putting a JP V-Tac tube on my 16" upper, and was wondering if anyone would share their opinion of this piece of gear? Also, pics of a mid or rifle length tube on a 16" upper would be appreciated. Thanks in advance! I'm picking up my new upper today and it has the V-tac, Ill let you know what I think in a day or so. ETA: Picked mine up, but have not shot with it yet. In person the barrel nut does not stand out as much as it goes in the photos, it provides a nice transition (to the eye and the hand) from the receiver to the handguard. The tube is a good size, enough to hold onto, but nothing requiring giant hands to grasp. The texturing is also "just about right" subtle, but there. All in all, I'm glad I picked it for my "SPRish" build. I have been very happy w/ my Vtac handguards. 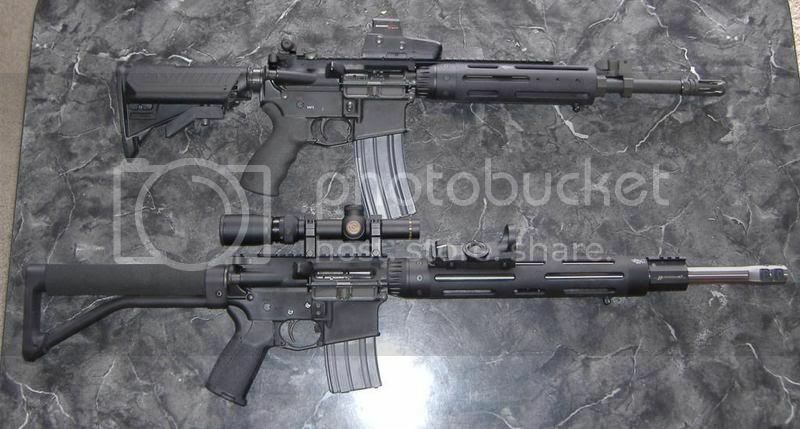 Im currently working on another SBR upper using a 10.3" WOA bbl and a mid-length VTac handguard. The only drawback that i can see is; you have to use 'red' loctite to attach part of the handguard to the upper reciever. What variable optic is that in the lower pic? ETA Actually...not so sure now. b/c here is a pic of the one you're referencing to..unless the bodies are different for the X32/X20/etc. Nice little scope for the price. Thanks for the replies and pictures! Like mine too. I used blue Loc-Tite for the barrel nut on mine, and it hasn't budged since I put it on about a year ago.